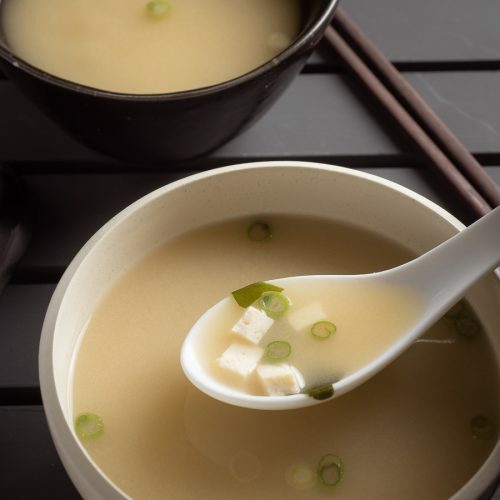 Want to make Japanese miso soup at home? Want to make it in less than 10 minutes? This is the recipe for you. I love Japanese miso soup. It’s like comfort in a bowl. Salty, complex flavours. Wholesome. Reach down inside and make you happy. Think I’m a bit crazy? How good can something with 4 or 5 ingredients be? Maybe you don’t love it like I do. The thing that has always slowed me down is the dashi. A quick bowl of miso soup when I’m in the mood gets killed pretty fast if I have to make dashi first. Sure, it’s better, but it takes time. Dashi means you need to have kombu and bonito flakes at hand. Simmer. Strain. I’m all for authentic but I also would like my Japanese miso soup right now. Not two hours from now. Not tomorrow. Enter hon-dashi. It’s cheating I guess. But it takes as long as it takes for water to boil. That’s it. And it keeps forever. You can get it at just about any Asian market. Little granules of instant dashi. 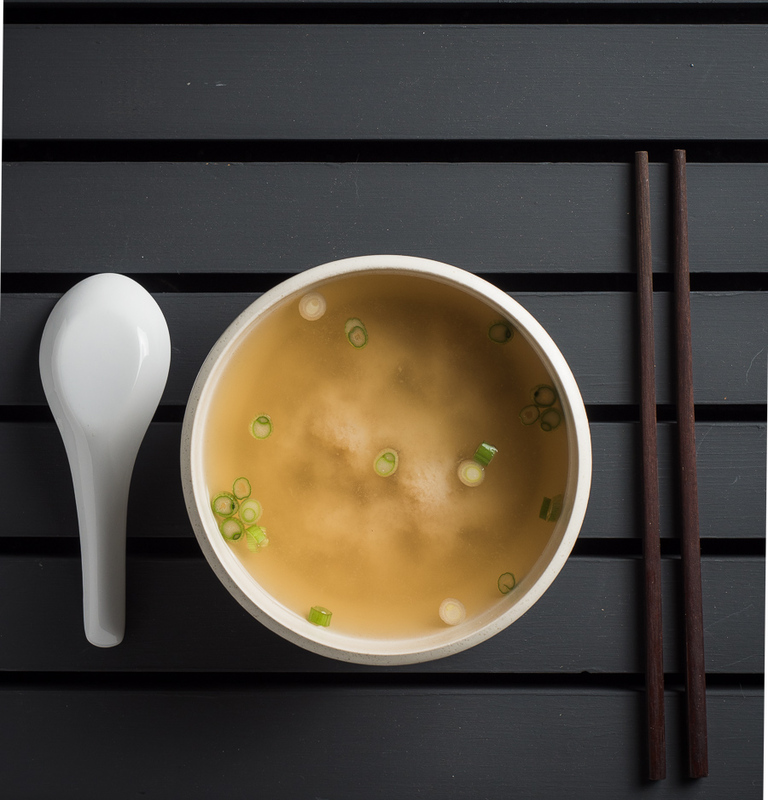 That’s how miso soup goes from hours to minutes. Pretty sure lots of Japanese home cooks are using hon-dashi. The other trick to making Japanese miso soup is a good one. Don’t put your miso into the dashi broth and chase around lumps. Put your miso into a small mesh strainer. Put the strainer into the broth so it’s wet all around but not fully submerged. Then use chopsticks and stir. Work the miso through the strainer. No lumps. That mystery green stuff floating in the soup is wakami. It’s dried seaweed. I like it. It’s an extra step though. Might take you 12 minutes to make your miso soup. If you can’t spare the extra 2 minutes just leave it out. That’s it. Easy. 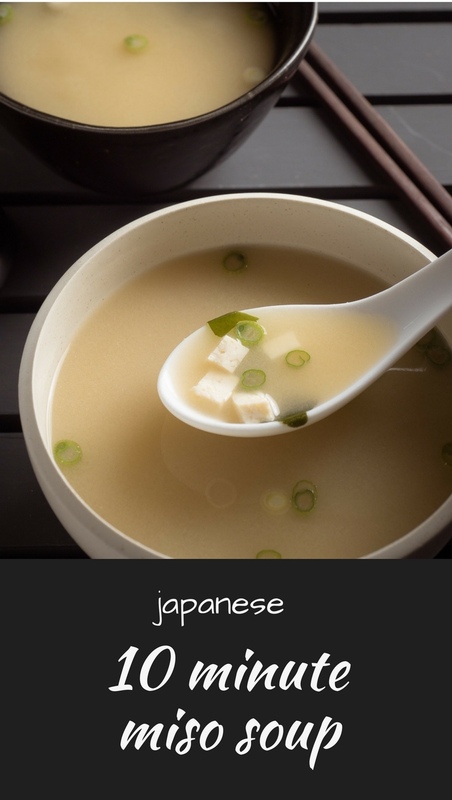 Japanese miso soup to order. Anytime. 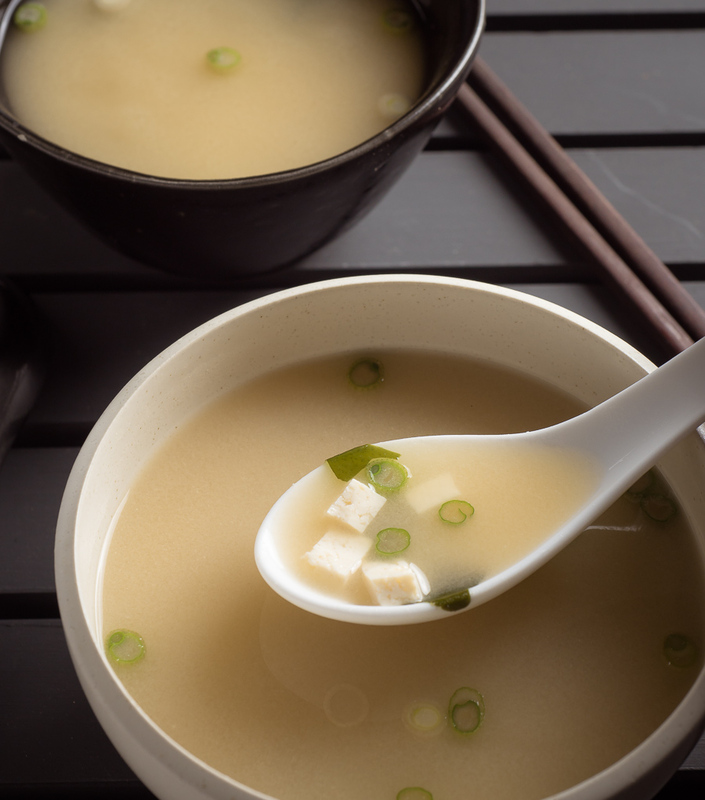 You can make delicious miso soup in 10 minutes flat. Hon-dashi makes it easy. 5 Tbsp shiro miso - you can use Aka (red) miso if you want a stronger taste. If you are adding wakame, bring a small amount of water to boil. Add a pinch of dried wakame. You won't believe how much it expands. It's crazy. Strain it, slice it up and set it aside. Discard the water. Add the hon-dashi to 5 cups of water. Bring to a boil. Let boil for a minute or two. Remove the pot from the heat. Put the miso in a small mesh strainer. Now lower it into the broth but keep the top above the surface. Use some chopsticks to stir the miso, pushing it through the strainer. No lumps! Add the diced tofu and reconstituted wakame if using. Garnish with sliced green onion. Serve. Enjoy. In appetizer, japanese, soup. Bookmark the permalink. This looks like a perfect pick-me-up. Am going to hit T&T supermarket this week for the (few!) ingredients required. Always fun to visit Asian grocery stores. I seem to leave with 10 times more stuff than I planned every time I go.